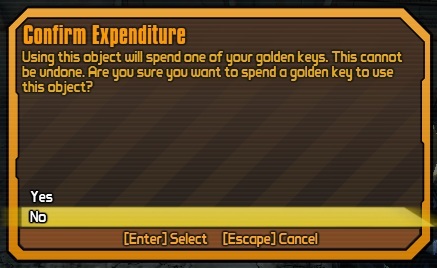 Golden Keys are special keys in Borderlands 2 that unlock a golden chest which gives you very powerful and rare items. Golden keys can be obtained by pre-ordering Borderlands 2, registering for a SHiFT account in Borderlands 2, redeeming SHiFT codes (which are released randomly), or ordering the GOTY edition from Steam. Scroll down, Click here, or Press End to jump to latest SHiFT codes. Note that when pasting codes into the steam version, it may be necessary to use right-ctrl+v. SHiFT Codes are special promotional codes released by Gearbox Software and other sources, some of which are only active for a few hours before expiring, while others have been valid for years. Guns, Shields, and even Relics! All SHiFT Codes which are Black in color are still working. All SHiFT Codes which are Red in color are those that have expired. If a code is past its expiration date and still works, please change the "Expected Expiration" to "Unknown". Please add new SHiFT Codes at the end of the table. Thanks! Using a Golden Key to open the Golden Chest will give you an Epic Item (Purple in color), an E-Tech Gun (Dark Violet/Magenta in color), or a set of Rare Items (Blue in color). Each time you open the chest you will receive one to four items depending on what items are available, similar to how loot chests work in the rest of the game. Any item that comes from the chest is scaled to the level of the person who opens the chest. The minimum level that the items can be however, is 7. For example, if a level 4 character opened the chest the gear would be level 7, whereas if a level 42 character opened the chest it would be level 42. NOTE: The chest will never spawn Seraph gear (Pink in color), Pearlescent gear (Cyan in color), nor Legendary gear (Orange in color). Here's some different Info Pages based on the Seraph topic, Borderlands 2 Seraph Weapons, Borderlands 2: Seraph Shop, Borderlands 2: Seraph Crystals, Borderlands 2: DLC3 Seraph Weapons. Based on the Pearlescent topic, Borderlands 2: Pearlescent Weapon Rarity, Borderlands 2 Pearlescent Weapons, Borderlands 2: Pearlescent Guns Red Text Meanings. Based on the Legendary topic, Borderlands 2: Legendary Drop Locations, Borderlands 2 Orange Loot Farming Locations by Area, Borderlands 2: Legendary Class Mods. NOTE: It appears that SHiFT codes now (post Borderlands Pre-Sequel release) work for one game or the other. (I personally tried to use the new codes for the Pre-Sequel, after I'd already used them for that game, on Borderlands 2. The message was that I'd already used them, not that they were invalid). Others may want to look into this possibility as well. The game will tell you if the code is for another SHiFT-enabled game. New Golden Key Available. You have ___ Golden key(s) now available for use! 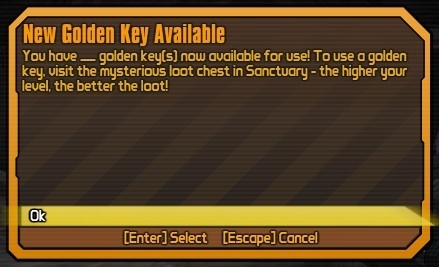 To use a golden key, visit the mysterious loot chest in Sanctuary - the higher your level, the better the loot! Confirm Expenditure. Using this object will spend one of your golden keys. This cannot be undone. Are you sure you want to spend a golden key to use this object? Gearbox Software Forums: http://forums.gearboxsoftware.com/ Also all shift codes will soon be patched. Many gamers have reported that a patch that was released December 2015 added 10 golden keys and 60 badass tokens to their account. The result of this is also said to have reset the amount of golden keys you have to the amount that would be if none had ever been used. For example, if you had used 2 golden key codes and then opened the chest, after the patch you would have those golden keys back again as if they were never used to open the chest. For the PS4: (As of 09/07/2016) While you are in the game, whether in Co-op or just by your self, bring in another one of your saved characters to start the Split Screen mode, and the second character will receive 11 Golden Keys, but just on that particular character. The only way for this to work, as far as I know, is to bring in a second saved character from the same profile you are playing on your PS4, if you happen to have multiple accounts on it. And you can do it as many times as you choose, all you have to do is take the second character out of your game and then put it back in. On February 13th, 2014, and again February 14th, 2014, Gearbox released a SHiFT code that unlocked special Valentines Day skins Customizations for each character except Krieg. This promotion was known as 'Loverpalooza' and also gave the first character played a Heart Breaker of the same level. A separate code for Krieg's "Loverpalooza" skin was released on March 16th, 2014, so he wasn't left out. Some users are replacing keys with word 'Expire'. Please do not follow this practice. You are not contributing and you are just deleting keys. Make sure you have read the general guide at the bottom before you edit ANYTHING. SHiFT codes may eventually expire. When a code expires, DO NOT REMOVE ANY SHIFT CODES. Only mark that the codes have "Expired" in the "Expected Expiration" section. There is a limit of 255 golden keys per account. ENSURE YOU WILL NOT EXCEED THIS before redeeming a code. If you find new golden key codes anywhere, please edit the section below to share. Some codes are limited quantity, or expire after a few hours. You can bookmark and check often for new codes, so that you don't miss any. On PC/Mac/Linux, you can copy and paste the codes. Be sure that you didn't copy a space or new-line character at the beginning or end of the code. If you copy with a space at the end it won't work. Please don't use spaces before and/or after the code. For the class mod SHiFT codes, the items will appear in the backpack of, and be the same level as, the first character loaded after code redemption. If the character is above Level 51, ensure you are in Ultimate Vault Hunter Mode to receive the item of the appropriate level. From anywhere on this page, pressing the END key will get you the latest SHiFT Codes. This page was last modified on 19 April 2019, at 15:35. Content is available under Creative Commons Attribution Non-Commercial Share Alike unless otherwise noted.